The christmas day 2005 was so precious and heartwarming for me!! but I've been spending christmas day quietly and calmly since I came to the US. and experienced traditional American christmas... American christmas dinner and presents under the tree! A year ago (23 years-old), I spent time with my friend watching "24" and cooking dinner. I had a terrible accident with drunk stupid guy too... it was the worst christmas for me so far. This year (24 years-old), on the other hand, I spent time with my baby boy Dustin!! It was the first christmas with my boyfriend ever. We went to his relative's house for christmas party. There were many Lebanese people and kids. They were speaking Arabic. I was the only Japanese there of course, but I had fun. There was a super cute child, so I was playing with him and I ate a lot of good Lebanese food!! which was what I've really really wanted so long, but I couldn't get. He was saving money for a very long time, and got it for me!! I was very impressed. Thank you sooooooooooooo much baby!!! I would never forget this christmas. because what I got were underwears, socks and gloves... but his grandma gave the same things (underwears and socks) too. Moreover, I gave him the wrong size one... so I returned it today and got new ones. I hope he would like them. 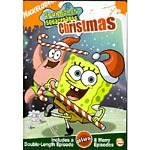 They are... Spongebob Christmas DVD and Slippers!! So we watched the DVD, but fell asleep after that... and we didn't do anything. It was really nice and impressive christmas! It is the best christmas ever!! ...Well, now I gotta clean up my room to welcome new year with good luck!